Students, please read the article below first, watch the video, and then answer the questions below. Have you ever watched an Internet video that teaches how to do something or explains an idea or problem? Have you ever considered making a video like that? 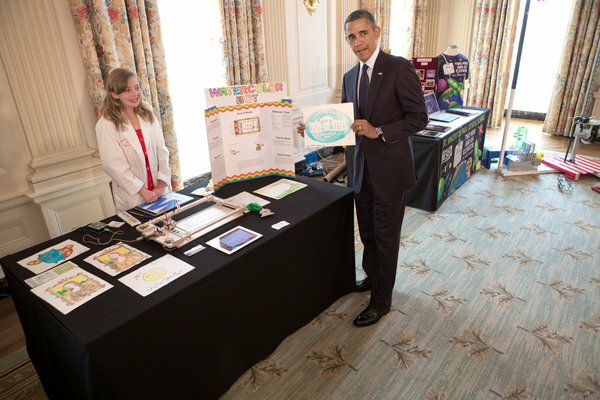 Sylvia Todd, 11, produced a robot-drawn watercolor painting for President Obama on Monday at the White House Science Fair. For the White House Science Fair, for example, Sylvia and her father created a campaign on a site calledgofundme.com. Two dozen well-wishers donated, and Sylvia was able to raise close to $2,000 for her trip to Washington. Earth Day ~ What’s the Coolest Thing You’ve Ever Seen In Nature? In honor of Earth Day, I pose this question to you. What’s the coolest thing you’ve ever seen in nature and where and under what circumstances did you see it? Where have you seen especially interesting natural vistas, creatures or phenomena? In your travels? In your own backyard ? At zoos or aquariums? In general, how much do you pay attention to the natural world? What effect does it have on you? What Would Your Ideal Summer Camp Experience Be Like? Students, if you could design the ideal summer camp experience, what would it be like and why? Students, this prompt comes courtesy of the New York Times Learning Network. The U.S. Postal Service made a recent announcement that it will stop delivering letters and other mail on Saturdays. My question to you is this: What is the best, most interesting, most memorable thing you ever received in the mail? There are more questions to answer further down. …The Postal Service continues to see a decline in mail volume as more people shift to electronic forms of communication like e-mail and online bill paying services. Packaging is one of the few areas where the agency is seeing growth. While many business and postal unions have generally opposed ending Saturday delivery, most Americans support the move. A New York Times/CBS News poll last year found that about 7 in 10 Americans say they would favor the change as a way to help the post office deal with billions of dollars in debt. – How do you feel about the Postal Service ending Saturday delivery? – What do you tend to get in the mail, if anything? – What’s the best, most interesting thing you ever received in the mail? Why is it so memorable? – What’s the most memorable thing you ever sent in the mail? Why?